The wonderful thing about jet lag when you visit the US is that you’re up and out by 5am. Why is this wonderful I hear you ask? Well picture this. You’ve spent hours researching places to eat in the city you’re visiting and then you make it there only to find they are fully booked for a few months or more or there’s a queue that’s going to take the best part of the day to get through. Sound familiar? Well with jet lag on your side you are always the first in the queue! See? In 2002 I visited San Francisco with my husband. He had a work thing and so I spent my days discovering the city on foot. I am the worst map reader but the grid system in San Francisco was easy to navigate even for me. On my second day, I chose the Mission District. It was a cool place even back then and it really was by chance that I found the Tartine Bakery. No queues to get in in those days. I ordered a pastry I think and then went on my merry way. Little did I know then how famous these would become. Fast forward 15 years and a work trip takes me back to San Francisco. The city has changed so much but the bakery is still there. Even more popular than ever. It has since won a myriad of awards and a huge long list of fans. 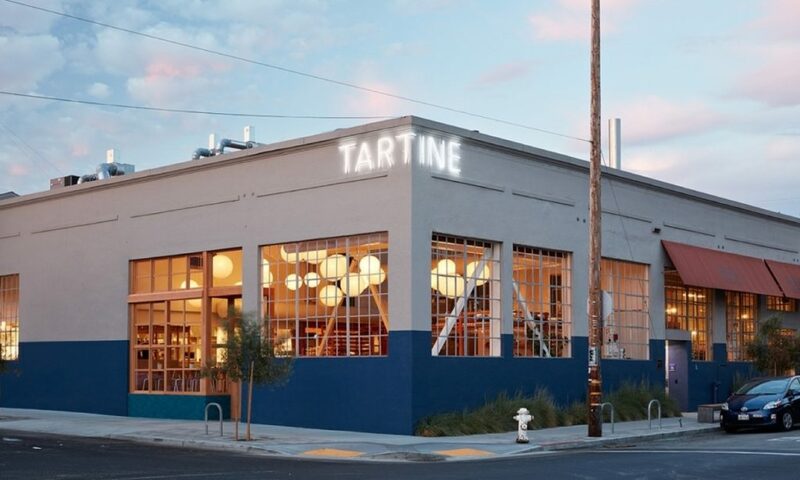 The team have also opened a bigger place about 20 minutes walk away called Tartine Manufactory. It doesn’t look like much from the outside and when I got there around 7.30am it was still closed but I could smell the bread. I went round the back. 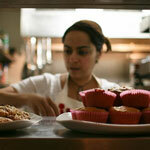 Chatted to some of the bakers coming off shift and then was the first through the door with a few locals at 8am. 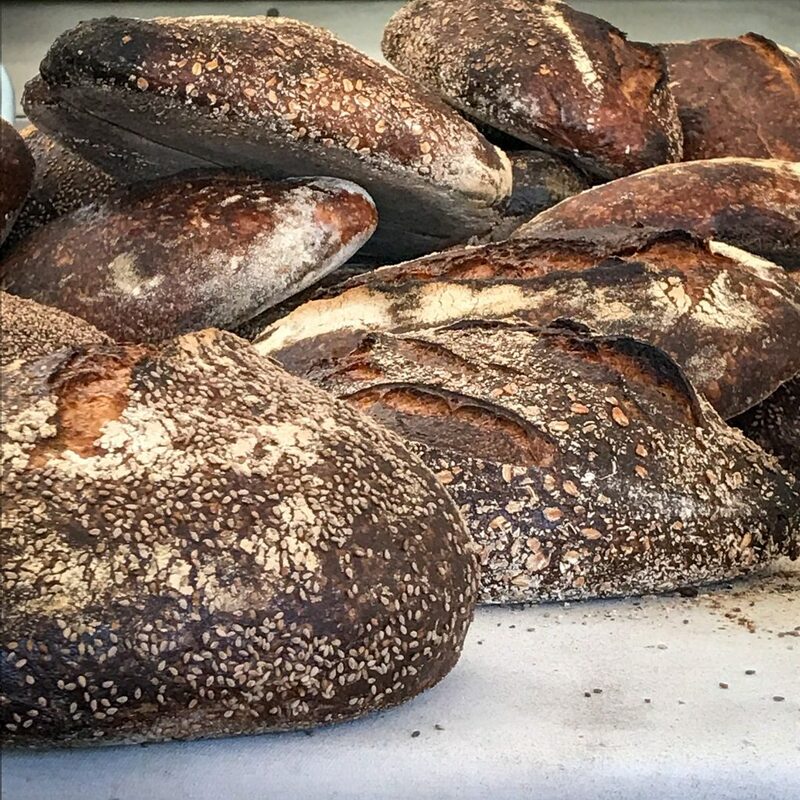 Tartine bread is ‘devoted to the use of natural leaven – some call it sourdough’. It was developed by Chad Robertson after years of working with other artisan bakers on his travels and in the US. If you are a baker and don’t have his book Tartine Bread, it is well worth investing in. And it is an investment. Not in cost but time. It took me about a week to read it cover to cover and then I read it again with my husband to plan how to make the starter and then finally the bread. My husband now has a rhythm now at home so we get two lovely loaves every Sunday or Saturday evening. Now sourdough does not come better than this. In the Manufactory, there are rows upon rows of loaves. It’s a semi open plan kitchen so you can see the bakers at work. The Tartine loaf is dark. Some would say burnt or over baked. But it’s not burnt and it is by no means over baked. Cutting through the crust reveals a magnificent, soft bread with huge air holes. It’s tangy and rich. When my husband’s loaves come out, half are demolished with just salted butter. In French ‘tartine’ simply means slice of bread. It’s topped with all sorts of ingredients rather like the Smorrebrod in Denmark. The Manufactory has a fantastic breakfast menu with tartines but also porridge and pastries. 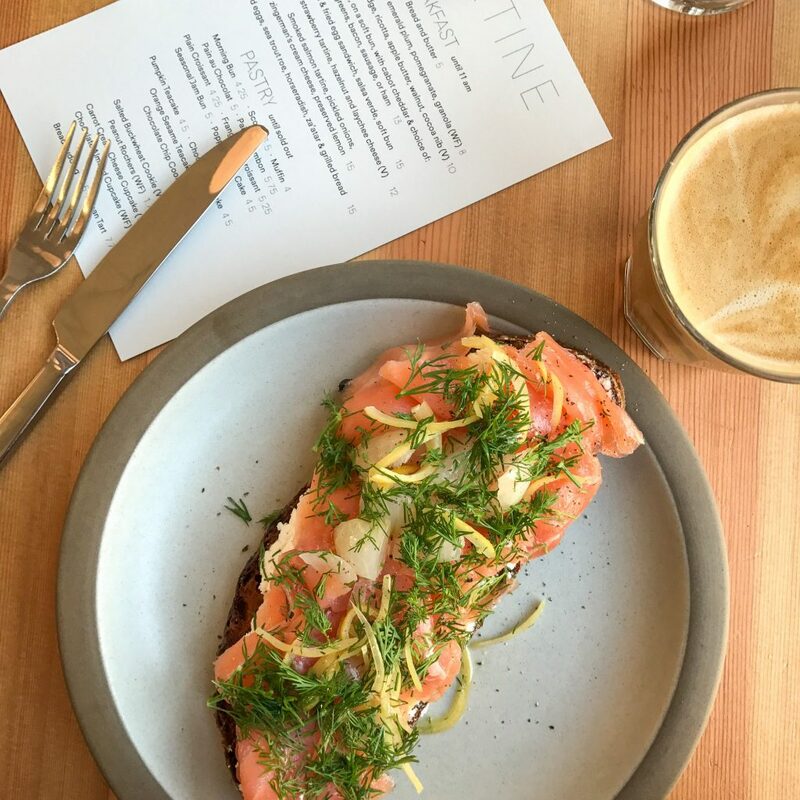 The coddled eggs with trout roe and za’atar and toast for dipping intrigued me but I opted for a Smoked Salmon Tartine with Pickled Onions, local Cream Cheese and preserved Meyer Lemons. It. Was. Good! The almond latter I had on the side was equally good. I was pretty full after that because as you can see it was a sizeable portion but I couldn’t leave without trying something sweet. I opted for a Peanut Rocher not knowing what a Rocher was. Well I can tell you it was a fluffy chewy meringue blob with caramel peanuts running through the centre. Oh my. That was good too. I left totally sated. It would have been perfect if Chad had been in town to sign the book I bought but sadly it was not to be. I have recreated the above at home so many times since this trip. On my husband’s sourdough made using Chad’s kindly shared recipe. It always hits the mark so I’d encourage you to give it a go. Just make sure you get really good pickled onions. Pickled beetroot also works well. So have I convinced you that jet lag is a good thing? Do you have any secret jet lag breakfast spots to share? Sounds worth getting out of bed that early for!